It’s as easy as 1…2…3. BMW have added another brilliant car that makes you wonder whether you should ever drive a petrol motorcar again. The BMW 123d city hatch is bound to be popular for more than just its thriftiness. Let’s face it; most people have a bad impression of diesel cars. Some would see the diesel alternative as noisy, hard to start and smoky. Some might sneer at diesel vehicles for lacking the get-up-and-go of their gasoline-powered machines. And greenies totally dislike them for their perceived environmental transgressions. However, people need to get down off their high horse and realise the massive advancements made in diesel power plants that have really only occurred in the space of the last decade or so. Superior diesel engine design now ensures that what’s coming out of the tailpipe is no dirtier than the emissions from your average petrol four-door sedan running the roads. The power of a modern diesel engine is quite outstanding, and diesels now have the speed, fuel efficiency and minimal emissions to rule the fossil fuel roost. Diesel is also cheaper at the pumps, so check out the stunning new BMW 123d. You don’t need a science degree to see just how good this little German vehicle is. The BMW 123d accelerates from 0-100 km/h in only 7.0 seconds, while the car’s top speed is a very swift 238 km/h. This 150 kW four-cylinder, two-litre engine is sensationally powerful, and the maximum torque figure of 400 Nm is simply stunning – particularly as this amount of grunt is available from only 2000 rpm. The BMW 123d is a diesel, and the figures are pure performance. When the fuel consumption is kept as low as 7.0 litres/100 km around town, you know that it doesn’t get any better than this. The BWM 123d blend of performance, fuel efficiency and refinement leads the way in the small car market. Add to this a rear-wheel-driven chassis and impeccable build quality, and the result is a superbly fun little car. Gunning through tight, twisting turns is a hoot when there is so much torque to pull you from one corner into the next. The flat, balanced handling of the small BMW 123d is the best in its class, and it even betters some of the bigger quicks you see on the Australian roads. Vehicles with front-wheel drive tend to have more weight on the front axle than the rear, and as a result these front wheelers often understeer when cornering at speed. Handling is compromised and the car tends to slide towards the outside of the bend. The weight distribution in the BMW 123d has been almost perfectly balanced between both axles enabling quick steering and agile handling. The front axle on the BMW 123d is also made of aluminium to keep the front end light and the overall weight of the car low. The rear-driving BMW 123d boasts active steering and Dynamic Stability Control to aid even further the exceptional on-road 1-Series characteristics. Safety is by no means compromised. 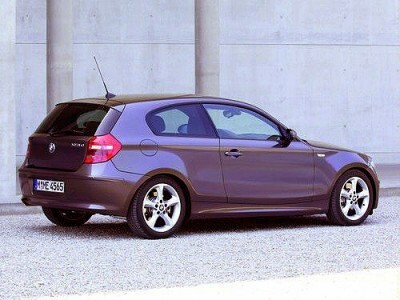 The BMW 123d actually weighs in at over 1400 kg and is very solidly built. Enforced body panels and framing have ensured that the vehicle is supremely rigid and the body shell very strong. Crash sensors are ready to react immediately, deploying the belt force tensioners and the airbag system which comprises of six airbags as required. At BMW, the opportunity for creating your own individual BMW that has optional features and luxury items that suit your tastes is wide and flavoursome. You can have your own BMW 123d the way you like it. There are so many options, and mix and matches, that you are sure to be totally impressed and totally satisfied with the end result. If you like the gorgeous M styled body kit you can have it for the BMW 123d Coupe. It’s also available for the Cabriolet BMW 123d. You might like to have your front seats heated on cold mornings. This option is available too. A BMW communications package is also available. All you need to do is consider which optional extras you might like to add to your already well equipped BMW 123d. Standard items like cruise control, electric windows, climate control, a premium sound system and cup-holders are all there – as you would expect. And what you will definitely have, if you are a serious buyer, is one of the hottest small cars money can buy. For any more information on the BMW 123d, or for that matter any other new car, contact one of our friendly consultants on 1300 303 181. If you’d like some fleet discount pricing (yes even for private buyers!) we can submit vehicle quote requests out to our national network of BMW dealers and come back with pricing within 24 hours. Private Fleet – car buying made easy!